I spent a productive day today at work doing some arts and crafts in between calls. 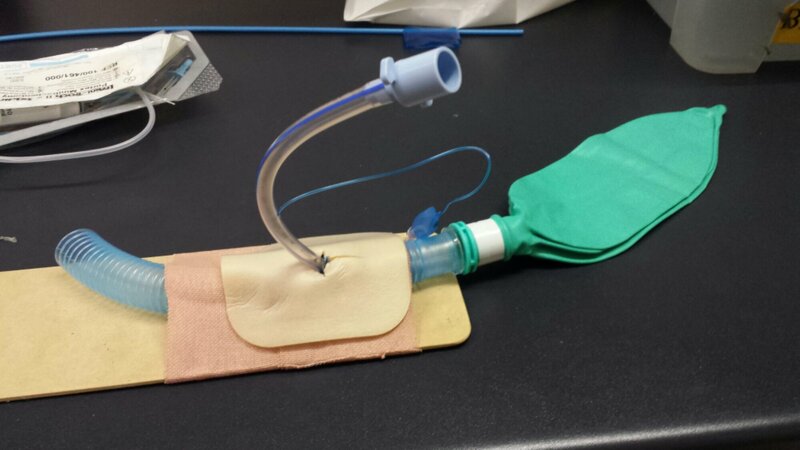 Specifically I tried to recreate the training larynx I played with at the SMACC Gold airway workshop. I think these were made by Scott Weingart and/or Rich Levitan, but I’m not actually sure. I apologise if I have got that wrong. I think I did a not bad version of re-inventing the wheel though! Anyway, here is what I did. Old wooden arm splint as a base. 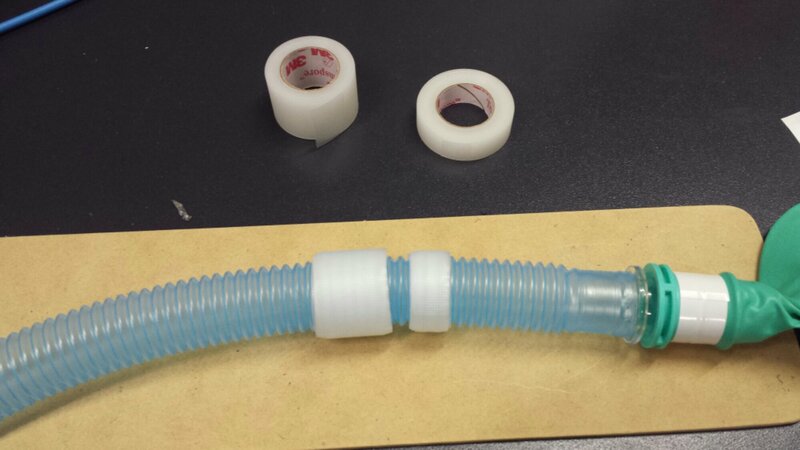 Wind tape around the tubing to simulate the thyroid bone (1 inch tape) and cricoid (1/2 inch tape. Wide tape is then used to secure it all to the board and act as skin. Several layers may be required. 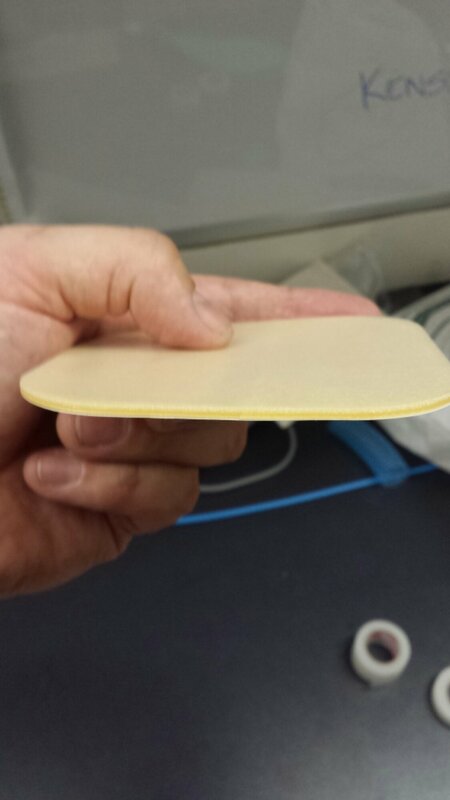 I have the placed this thick adhesive foam dressing on top to simulate adipose tissue and skin better. The foam skin layer things are quite expensive so may not be desirable. Multiple layers of brown fabric tape will work, or even the brown plastic tape as it feels a bit more like skin. Obviously it’s not as good as the real thing, but it simulates the tactile sense reasonably well. 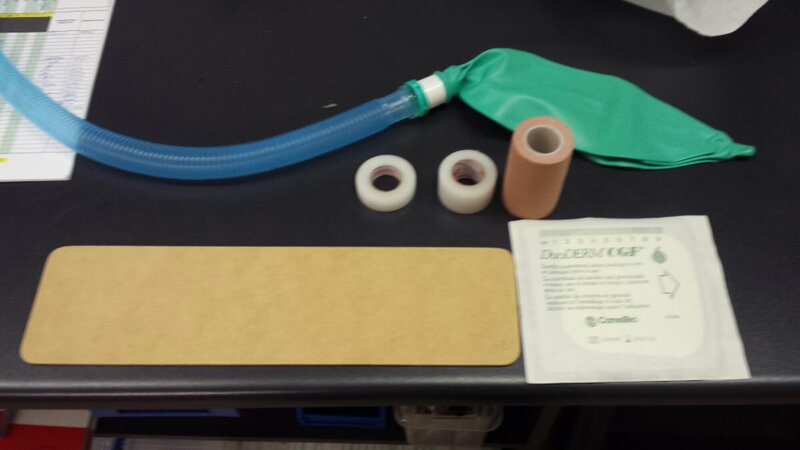 Surgical cricothyroidotomy is all about the feel so hopefully this helps experience that. 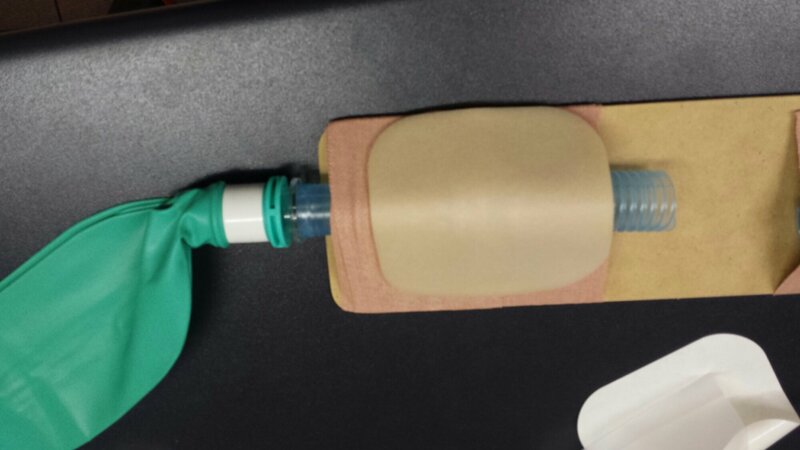 This entry was posted in Airway, Education, Ventilation. Bookmark the permalink. Was good catching up at smaccGOLD…even if felt like a re-hash of previous FOAMed. Keep up the blogs & podcasts mate, you do GREAT stuff. Not that I have any place doing this sort of thing but I was curious and had a fiddle myself after SMACC. FWIW, I removed the neck skin from the branch sim man, placed a folded triangular bandage soaked in water, covered with glove and pulled tight across the neck, taped into position. The sim man functions as normal and everything is roughly anatomically right and you can have a scenario as normal. You can rest your hands in all the right spots. 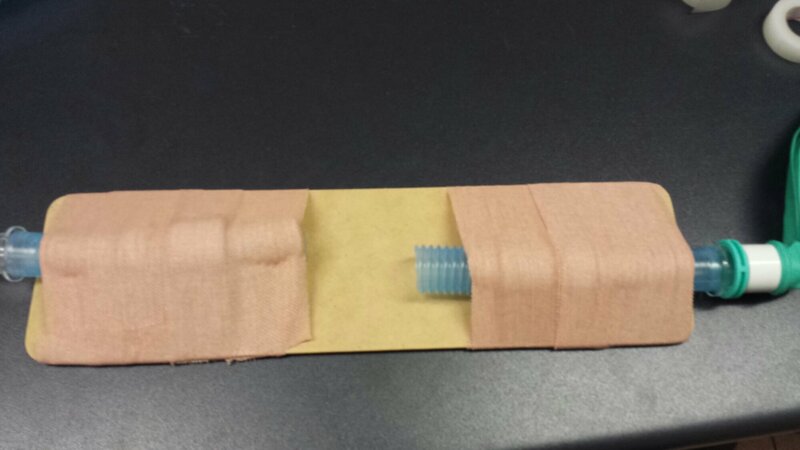 When you pierce the glove, the water from the bandage “bleed’”. 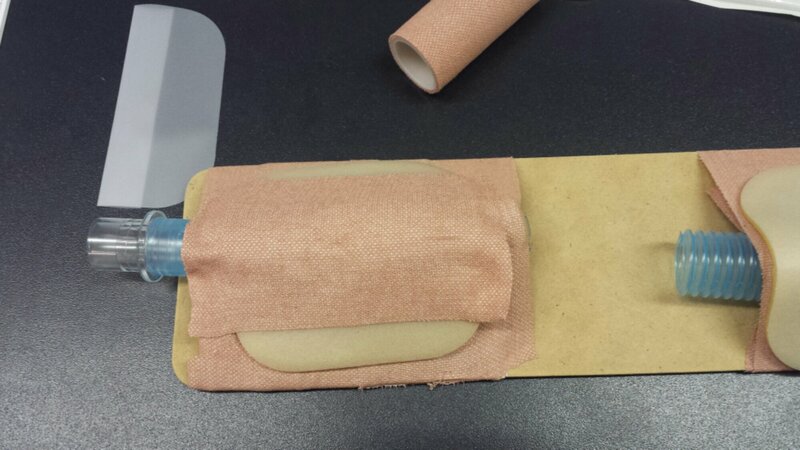 The taught layers of the bandage separated in a roughly similar way to how skin did during my uni dissections. It also simulates a fair bit more tissue than the average sim man too (fat patient?). Some food for thought perhaps…We do get so bored in the country sometimes. Nice, I might have a play with that tonight if I get the chance. It would be nice to get lots of “blood” around to make me concentrate on the tactile rather than the visual.